Well, maybe not ALL about needles...maybe just the basics. I don't know about you, but I've been sewing for most of my life...started when I was very young and never really thought about needles at all. My mom always had her machine set up, ready to go and I just sewed. As a grew older and sewed in home-ec class, again the machine was set up with the needles. Then came the years when I purchased my own machines and began to sew more with different materials and fabrics...kids clothing, tote bags, home decor etc. I purchased needles all the time. Well, I don't sew as much as I did in the past, but I still sew weekly...mostly with 100% cotton though. For that reason, I buy universal needles...why? I don't know. Probably because I'm cheap and don't want to spend money on "denim" needles or "leather" needles. If you are just learning to sew, all the different numbers on the package can scare you. You probably just stick to the word Universal and hope for the best with the numbers...right?!! Well, let's try to help you out a little. 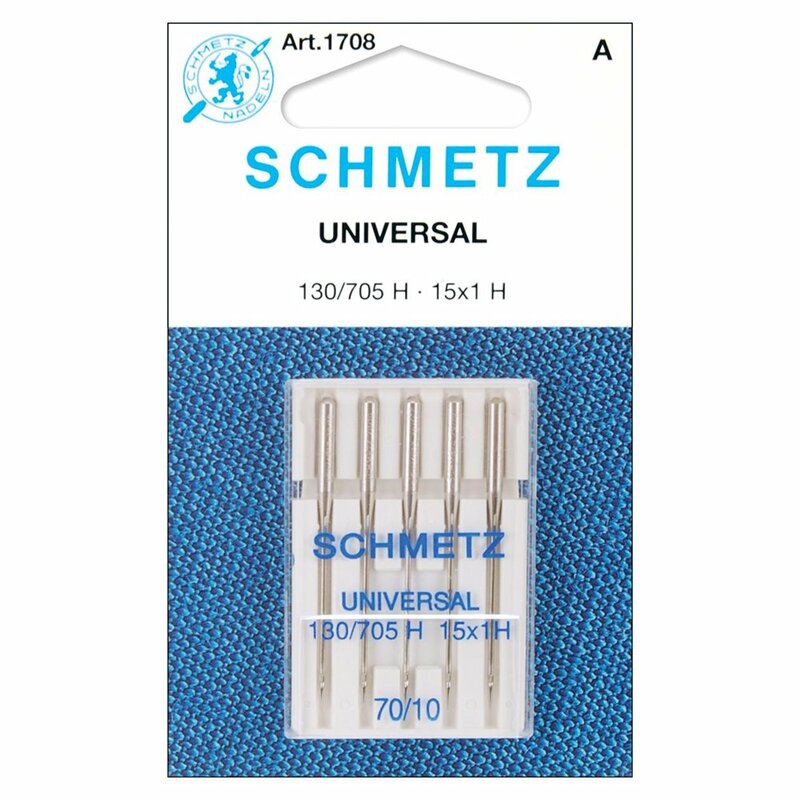 From what I've researched on the Internet, this is the needle system that's used for most household sewing machines. It has a flat shank and a scarf. This international system has an "H" on the label. H = Hohlkehle which is German for 'with scarf'. The Scarf is...the indentation above the eye of the needle that allows the bobbin hook to come up and smoothly grab the thread under the throat plate to create the stitch. There are 2 numbers usually divided by a slash or one number over the other. One set of numbers is American and the other is European. You may see American over Universal or Universal over American. Either way is the same. The American System is size 8 -19. 60 is fine up to 120 the heavy. The size of the needle determines the size of the whole the needle makes in the fabric and what thickness thread you can use. For example, you wouldn't want to use a size 18 needle with thick thread on silk fabric you were using to make a blouse. You would use a lower number with a finer thread. The same holds true for home decor fabric. You would want to use a larger needle with a thicker thread for strength and the final look of the stitching. There is another whole area on thread selection, but that's for another day. The needle type is for certain fabrics or materials. There is sometimes a letter after the Needle System number. For example, below is 130/705 H-Q. The H for flat shanked sewing machine system for general household machines and the Q for quilting. I wanted to let all of you know, I am NOT an expert on sewing needles at all. I just shared what I knew from years of sewing and what I researched online. It would be great if everyone could share their tips and tricks on needles in the comment section. The more knowledge on this subject the better. Click HERE for a link to Michelle's post. She emailed me to share great videos on making sewing needles. because sewing with a less than sharp, slightly bent or otherwise damaged needle can seriously mess up the timing on your machine. you wouldn't drive your car for 20 or 30 thousand miles without an oil change- change your needles regularly. 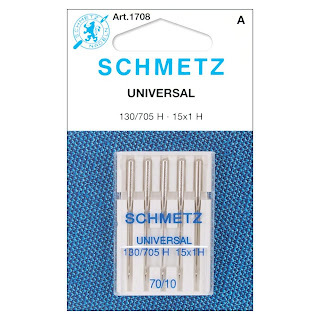 There is a great you tube clip ofa man from Schmitz explaining that really we only need a topstitch needle, and nothing else. I use topstitch for patchwork, quilting and general sewing, and titanium in my embroidery machine: I have pack and packs of others, but never use them! Thanks for the information. I use Universal needles exclusively. I do have a few ball-point needles left over from the days when I made garments and used a variety of knit fabrics. 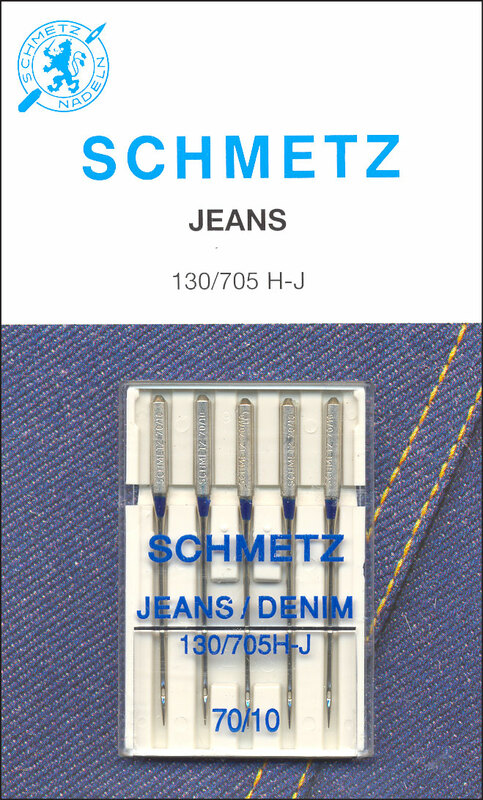 I have some denim needles, but I've never used them. Actually, Universal needles were created several decades ago (40 years or so?) for people who were doing little bits of sewing for both knits and wovens--not necessarily a good choice for quiltmakers. 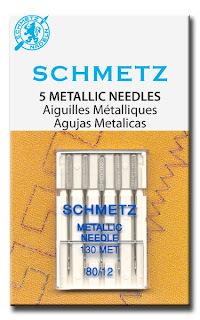 Superior Threads has a wonderful online guide to needles. 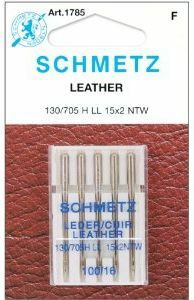 Sewing machine dealers and fabric shops love to sell Schmetz needles because they come four to a package and provide a good profit margin. I've used other brands and found they almost always work as well. I buy Organ brand in bulk, love them, and save enough money to change needles every few hours just the way we should. I remember when a neighborhood woman traded in her treadle on a new electric machine and told the dealer how proud she was that her treadle still had the original needle! Thanks for all this info. I am new to free-motion embroidery and have found metallic needles a godsend! Just one question for anyone though... how do you know when your needle needs changing? I inherited my beautiful old bernina with a stash of needles and I've no idea which (if any) have been used so I can't judge by time usage. If you know the sound your sewing machine makes while sewing, you'll be able to recognize the difference when sewing with a dull needle. It will sound 'clunky'. You may also be getting skipped stitches. If the uses needle has a nick in it, or is bent, it could be fraying the thread, ripping strands of fabric and hitting the throat plate. It's funny. I just talked about bad needles last night in my blog post. I guess every brand has a few 'duds'. I am going to link a blog post over here to your blog so people can learn what you know. Very informative. 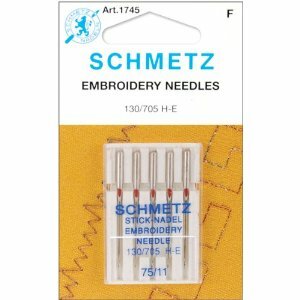 I use Schmetz Topstitch needles in my Juki TL-98E machine on my Hinterberg Machine Quilting frame, with my Quilter's Cruise Control. 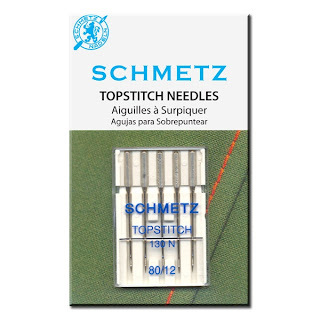 The folks at Hinterberg recommended the Topstitch needle, for the bigger eye, because of the multi-directional sewing. I love the topstitch needles. They work very well. Thank you for the info! Im newer with the whole sewing thing and even though I do a lot of it, I didnt know most of the above! Great research Karen. Thank you for sharing. I'll definitely use this post for future reference. I agree with the others about Superior Threads - they have great information about needles though I haven't tried their new brand yet. To determine the correct size and type of needle to use in your machine, you need to think about the project you're working on and the type of thread you're using. For example, if you were making a tote bag out of canvas, you should probably use a cotton or polyester medium wt. 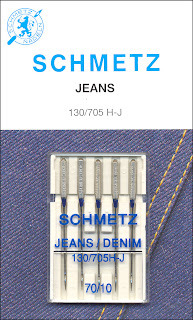 thread and a jeans/denim needle size 80/12 or 90/14. If you were doing some free motion quilting with a silk fine wt. thread, you should use a 60/8 or 70/10 sharp needle. There are so many variables that it's hard to use just one type of needle for everything. Thanks for this Karen, more research is needed for me. 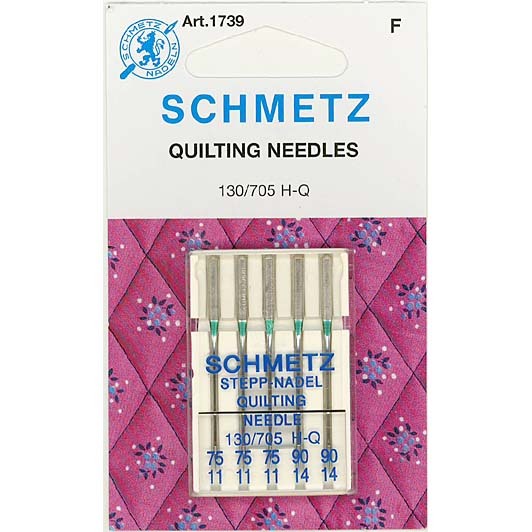 I've managed to get the right size but I think I probably need to look into those letters at the end and choose needles for quilting. Thanks Karen. 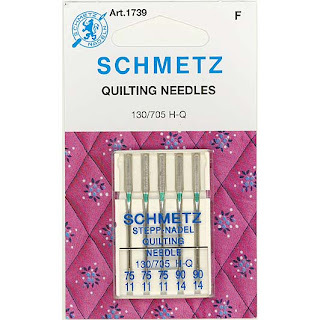 I knew about the sizes being Euro and American and the smaller the finer, but I never knew there was quilting and topstitch needles, you can learn something everyday! So glad I stopped by! My preference for quilting is to use a 10/70 denim/sharp for piecing and larger denim/sharps, or topstitch needles for quilting. Unless I am quilting with fine heirloom thread...a larger needle size isn't necessary. As someone has already pointed out, we really should be matching needle to fabric and thread. Universals work quite well. 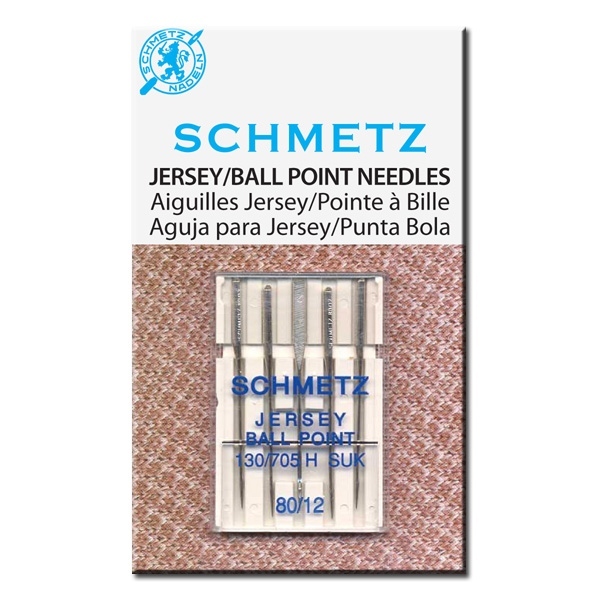 Except--in knits with a high lycra content, so jersey/ballpoint needles work better in this instance. Another exception for the universals is when you want extremely perfect stitches (ie precision quilt piecing, visible top stitching) The universal wiggles between the fibers and upon close inspection, the stitch is not perfectly straight. So sharps were reborn in the form of quilting and microtek needles. I actually learned a great tip from the lady who sold me my sewing machine. I sometimes forget which size needle I have in my machine at any given moment. I use finer needles for heirloom sewing and thicker needles for everything else - usually a 70. Anyway, the needle size is imprinted on the top of the needle. Slide the top of it into the Schmetz package. The top of the package has a magnifier that let's you see the imprint on the needle. Now my old eyes still don't always see it, but you younger people can. Thank you! As a new sewer, purchasing needles always leaves me feeling less than adequate. There have been many frantic text messages to my quilting friend. I have this pinned for the next time I need to purchase needles. This is such a great post. Very informative and useful. Thank you. This is too funny! 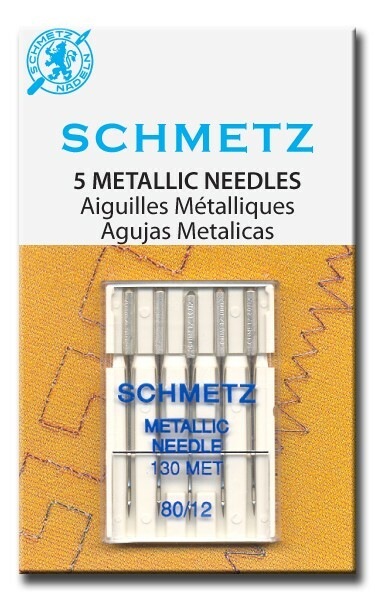 I just bought new needles for my sewing machine last week! I have an old Wizard sewing machine that were sold in the old Western Auto stores? I had to take it to a sewing repair shop just to figure out how to thread it! Now I tried changing the needle and it doesn't sew anymore. I think i need to play with it a little more, I hear if the needle is too high or too low that can cause issues.